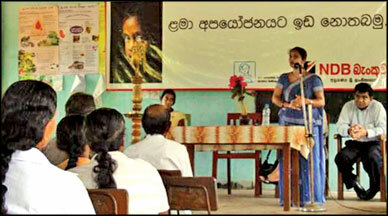 National Development Bank has initiated a series of programs to reduce child abuse over the years by educating children and parents. Ms. Sandya K. Wijerathnemenike, Child Rights Probation Officer (Mahara Divisional Secretariat) speaking at an awareness programme. Being the most vulnerable segment of any society, Children are the most susceptible to abuse. Incidents of child abuse are repeatedly highlighted in the global media as a very serious growing concern. Children are our future, and child abuse brings about complex sociological and psychological problems that devastate their lives and family. Despite its very grave and serious nature, child abuse remains taboo for forums in many countries and society, notwithstanding the increasing evidence of its occurrence in these very societies. Incidents of abuse leave deep and damaging impressions in a child's mind. Research shows that child abuse causes adverse health and mental impact on children and their families; these negative effects could even last a lifetime. Children suffer most when they are subjected to physical and mental cruelty; it could even cause retardation and serious impairment of their development into adulthood. For example, an abused child may even refuse to attend school and suffer from separation anxiety disorders. Child abuse even increases the likelihood of substance abuse, (e.g. ingestion of drugs), aggressive and risky behaviour, delinquency and depression. It could also cause personality and post-traumatic disorders, which may, when such children grow to be adults, lead to the abuse of their own children and/or spouse. Prevention is the best method to reduce child abuse, and to improve the safety and lives of children and their families. Parents and guardians are often incapable of detecting signs of abuse and the dangers it poses to their child. Inaction would only mean years of pain and heartbreak for young children who are unable to get out of this bad situation alone. Having identified this acute need, NDB Bank through its CSR initiative, the Prevention of Child Abuse Trust, together with the Department of Probation and Child Care has initiated a series of programs to reduce child abuse over the years by educating children and parents. The Trust is headed by a group of independent trustees, which include Eran Wickramaratne, CEO of NDB Bank, and the Commissioner of the Probation and Child Care Services Department, Sarath Abeygunawardena, who serves as ex-officio trustees. During the course of the past few years, the Trust has conducted several Child Abuse prevention and awareness programs in various parts of the island for parents, school principals, teachers and even students. This program is being continued this year, and over 600 parents have participated so far. They were instructed about various forms of abuse and the constituents of child maltreatment. The parents are given advise on what steps could be taken to prevent abuse, and how to identify any such incidents. The Program also encourages parents and educates them on how to build stronger relationship with their children in order to ensure open communication and build trust. Real life case studies are presented to participants to create a deeper understanding of the issues involved and the serious long-term physical and psychological impacts of child abuse. The Prevention of Child Abuse Trust aims at building awareness about child abuse as well as to provide aid and inspire hope in the lives of those who have been affected by child abuse. While aspiring to operate at the highest ethical standards and following socially and environmentally responsible business practices, NDB Bank has over the years, committed itself to several social responsibility initiatives.